Look another sweet corn recipe! This time I've added it to waffles along with some grits to make the perfect vehicle for crock pot pork. Top it all with spicy maple syrup and this one is a winner. I made the crock pot pork just like I've made crock pot beef in the past. A couple of pork steaks went in the crock pot with a sliced onion, a can of beer, 1/2 cup barbecue sauce, 1 tablespoon of malt vinegar and a tablespoon of horseradish mustard. Let it cook on high until the pork is fall apart tender, mine took about 4 hours. Remove the pork from the pot and shred. Matt came up with the idea for the spicy maple syrup and it couldn't be easier. Just mix maple syrup with Sriracha to taste. I was skeptical, but man it was the perfect sweet and spicy topper for this dish. Husk the corn and cook in a pot of boiling water for 5 minutes. Let cool. Cut the kernels from the cobs. Mix the flour, grits, baking powder, baking soda and salt together in a bowl. In another bowl mix the eggs, butter, milk and corn kernels. Pour into the dry mixture and stir until just combined. Let sit 5 minutes. 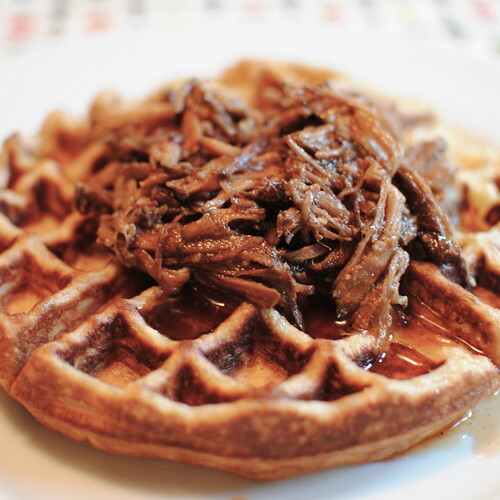 Top waffles with pork and drizzle with spicy maple syrup. Dig in! kat, no lie, this is the best savory waffle type creation i've come across yet--brilliant! What a great idea with the syrup and hot sauce! This takes boring BBQ and cornbread to a whole new level. Such a great idea!